In just less than two weeks, we open our garden at The Watch House in Broadstairs for the National Gardens Scheme. It has not been a long held ambition to let the public in, in fact it still seems a little absurd to me when you consider the garden measures just 20x30ft. However we were persuaded, quite forcefully by some proponents, to take the plunge and here we are just days away. The garden’s diminutive size is intended to be its USP amongst the other, more expansive gardens that open in Kent each year. We hope it gives visitors lots of ideas about they could do with their own small spaces and look forward to inviting them in to our little sanctuary. 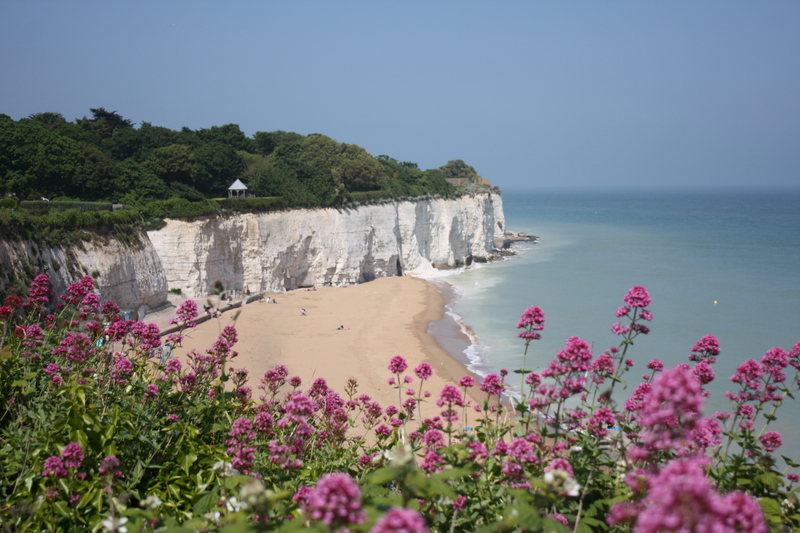 We moved to Broadstairs to be close to the sea and chose a town centre location. This meant a small courtyard garden, which we hoped would look after itself. We quickly found that we spent most of our time outside, but the space was cluttered with outbuildings of no particular historic interest. The house itself, two fishermen’s cottages knocked together, is not without charm, but hardly distinguished. In six years it will be 200 years old, an age I am sure the builders never anticipated it would reach. At the time of construction it was at the very edge of town, looking over the rooftops to the English Channel beyond, hence the name, The Watch House. It’s probable that the plot would have originally belonged to one of the buildings in the High Street, but is unlikely to have had a layout that would have been worth recreating. 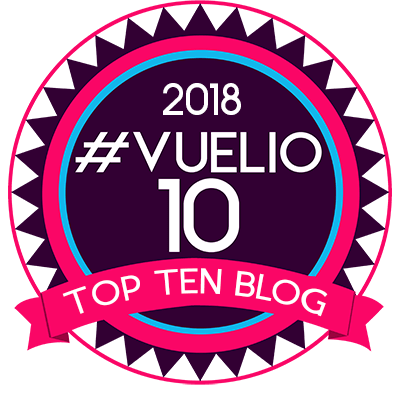 We took the decision to start again and turn it into a contemporary space where we could entertain visitors (it’s amazing how popular we became when we moved to the seaside!). Nothing apart from the surrounding walls remains from the garden we inherited in 2006. With a rectangle of this size the opportunities to create surprises and areas with different moods are limited. Instead, we decided upon what one might call a very traditional layout, with borders around the edge of a terrace. This was born out of necessity, as beneath the garden lies two vaulted undercrofts that cannot take a great deal of weight. One of our proudest moments was being chosen to feature in a BBC2 programme about Sissinghurst’s influential role in 21st century garden design. We have a garden room but, in comparison to Sissinghurst, The Watch House is a broom cupboard alongside the presidential suite! I hope the result of our garden transformation is anything but traditional. We have made as much use as possible of the vertical plane, choosing trees which are taller than they are wide to screen ourselves from neighbouring houses. The planting is unashamedly non-native. Indigenous plants in this essentially urban setting would be incongruous and the flowering season too short. Instead I’ve looked to California, The Canary Islands, Tasmania and South Africa for plants that will thrive in our sheltered microclimate. We also have a lot of evergreens for structure, which are wonderful until July when they all seem to drop their old, yellowing leaves simultaneously. Slowly the garden has assumed the feel of one of those tranquil courtyards one finds at the heart of the Riads of Marrakech. The mass of foliage, which needs keeping in check constantly, deadens any noise that comes from the narrow back street running alongside the house. Birds seem to think it’s a paradise, regularly nesting in our trees and climbers, serenading us all day long. The only thing we are missing is a water feature, but I figure we have the best kind just two minutes walk away, the sea. When we come home and close the gate behind us, the hubbub of Broadstairs seems a million miles away. In such a small space it’s been easy and inexpensive to incorporate little luxuries such as lighting, speakers and mains gas appliances, making the garden perfect for entertaining. Over the years we’ve probably spent more time in our beloved outdoor room than in any other part of the house. The initial project, which included design fees, demolition, materials, services, plants and labour, set us back the princely sum of £35,000. In my book that’s a small price to pay for such sustained pleasure and enjoyment. The garden is approached down a narrow passageway, which is the only opportunity we have to create any element of surprise or mystery before the whole space is revealed. The vista from the front gate remains important and is terminated by my favourite tree, Lyonothamus floribundus ssp asplenifolius, the Santa Cruz Ironwood. This year it is flowering for the first time; the heads of white, achillea-like flowers are the size of dinner plates. I hope they will hang on for visitors to admire in August. My attempts to keep the passageway clear of pots have been pretty lame. If the garden is the stage, then the slate path acts as the wings where a cast of young plants await their cue. Getting to the front door often involves wading through foliage and getting wet trousers! 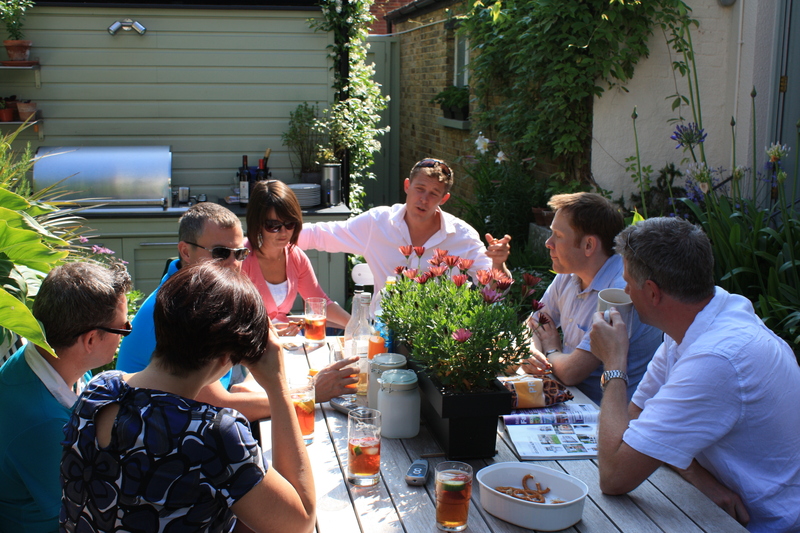 Our outdoor kitchen is the feature that’s most often commented on by first time visitors. “How do you keep it covered?” we are asked, “we don’t” is the reply, it survives perfectly well with just the barbecue protected, mainly from seagulls and their shocking toilet habits. We did not get it right first time. The original slate worktop had too many joins and wicked water into the cupboards, so it was replaced last year with the granite surface we’d always aspired to. 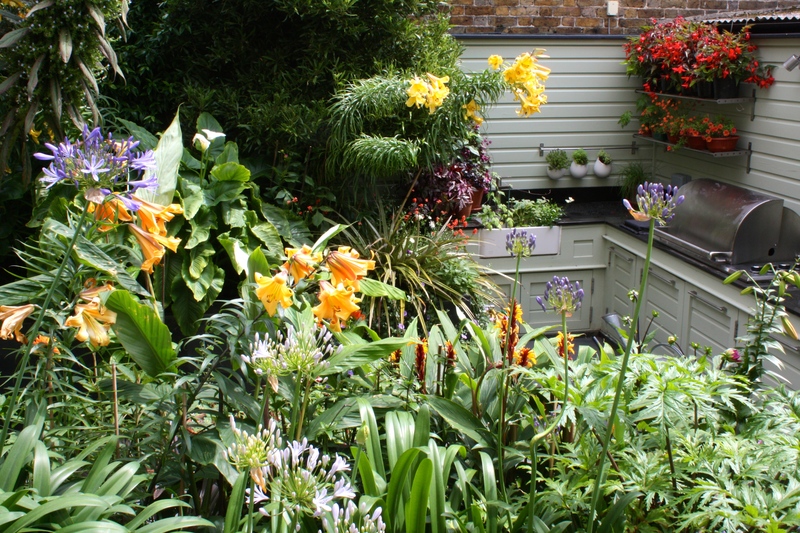 A ceramic sink in a garden is a godsend, useful for washing up pots, refreshing dried-out plants and chilling drinks. It looks as good as the day it was installed and comes up sparkling white after a quick scrub with my secret weapon, Astonish. Marine grade steel ensures that the barbecue and hob remain blemish free. We have no shed or garage, so the cupboards make a convenient storage space for pots, tools, fertilisers and garden chemicals – no room for baked beans here! 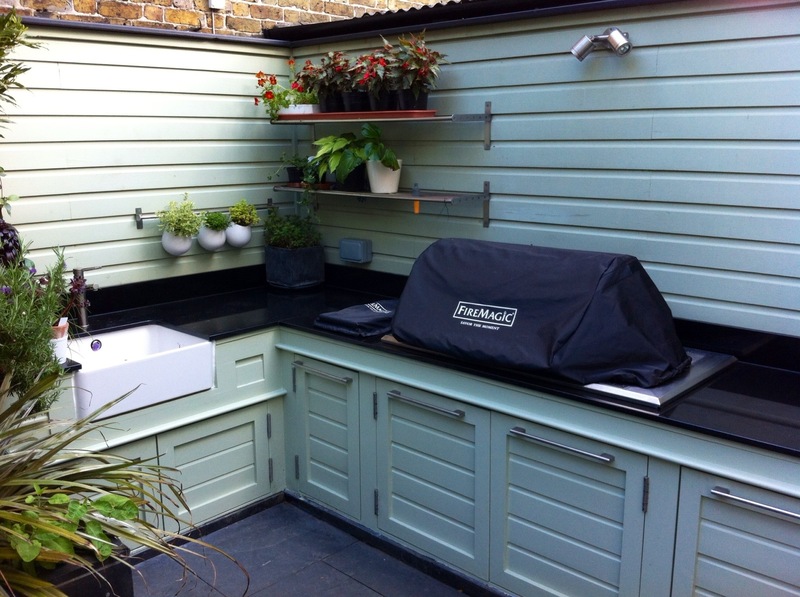 The shelves to the side of the barbecue were meant to be decorative, used occasionally for ingredients awaiting their turn on the grill, but have become the place to bring on seedlings and young plants in spring. In summer trailing begonias in fiery reds and oranges dangle dangerously from the top shelf. The last of the day’s sunshine hits the sink area at about 4.30pm, after which the garden is plunged into shade. It’s a warm spot and perfect for grouping pots of sun worshippers which I swap around regularly to keep them looking fresh. The combination of the moment brings together hot pinks, wine and plummy shades. It is lovely to be able to examine up close the unusual flowers of plants like Rhodochiton atrosanguineus, the purple bell vine. 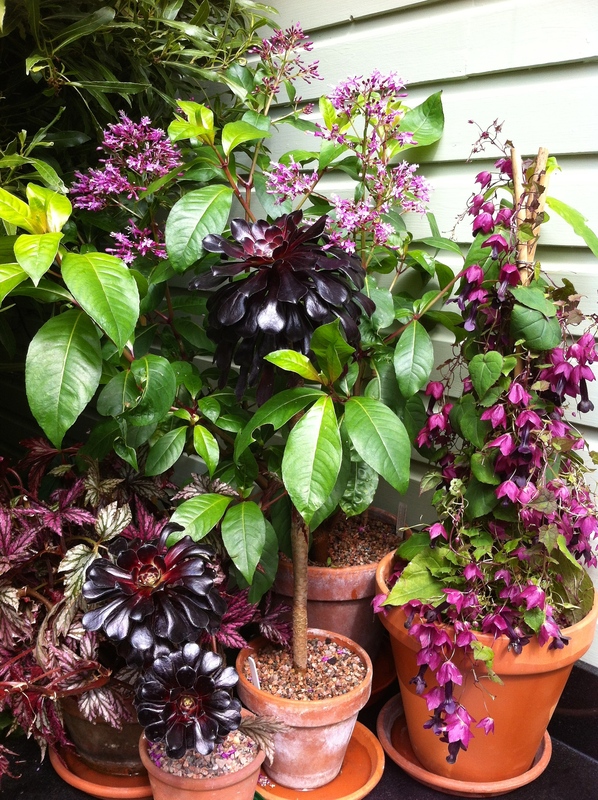 A combination of Aeonium ‘Zwartkop’, Rhodochiton atrosanguineus, Fuchsia arborescens and Begonia ‘Benitochiba’ by the outdoor sink. Maybe it’s a gardener’s natural instinct to try growing things against the odds, but I do like a challenge. Many of the plants I have collected over the years are slightly tender and on the whole they survive thanks to Thanet’s mild temperatures and long sunshine hours. Geranium maderense is the most borderline hardy for me, but emerges afresh from seed in years where the frost gets the better of the mature plants. I am not interested in having a low maintenance garden, they have no appeal to me, and instead create work for myself at every opportunity. The profusion of pots around the front door requires the most labour and planning. 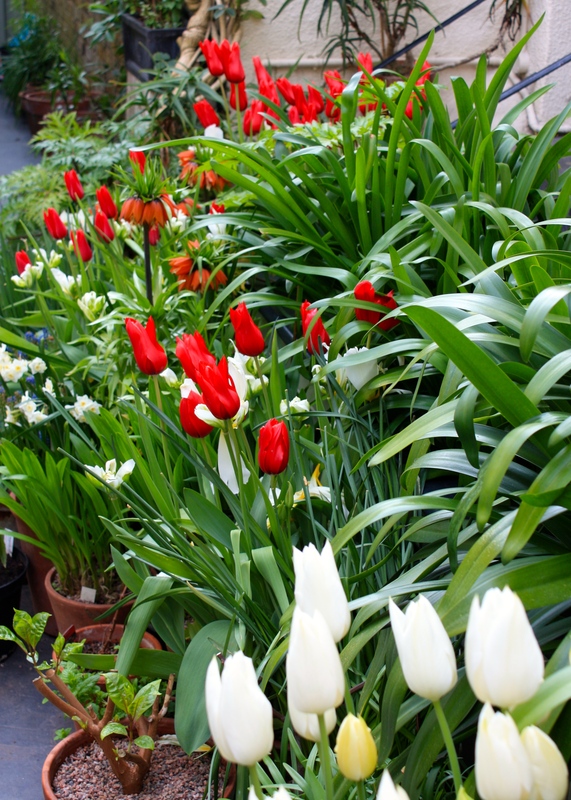 In October they are crammed with tulip, narcissus, muscari and fritillary bulbs, every year a slightly different combination depending on my mood in July when I order them. Bright colours work well because of the amount of evergreen foliage in the garden and enhance the generally tropical feel. I have tried limiting myself to white, but it just doesn’t work, so in come the reds, oranges and plums which I seem to gravitate towards. I have nowhere to store or replant bulbs from year to year (unless they are very special) so they are replaced anew every season. Winter is a quiet time, but the garden remains vital and green unless we experience a frost. Then the echium leaves hang down sullen and dry and the zantedeschias turn to slimy green mush. Once March arrives, the work, all done at weekends, is pretty constant, moving around pots to create new combinations of foliage, flower and texture. I start planting out tender perennials and annuals from Easter time, after which we rarely experience frost. This year the gamble has paid off, with many plants a good six weeks ahead of where they were last year. I make no apology for filling any gaps that appear unexpectedly with mature plants from the garden centre – this is something one can do inexpensively when working in a small space. Now I hope for a perfect storm of regular, steady showers, cool days and light breezes to keep the garden in tip-top condition for our open weekend. A chance would be a fine thing – our weather just isn’t that well behaved. I hope that one way or another I will have done enough to interest people and make the experience worth the £3 entrance fee. If you can come along on August 2nd or 3rd, I look forward to meeting you and showing you around. If not, I hope you enjoy this post and that a little of my enthusiasm for small scale gardening will rub off on you. 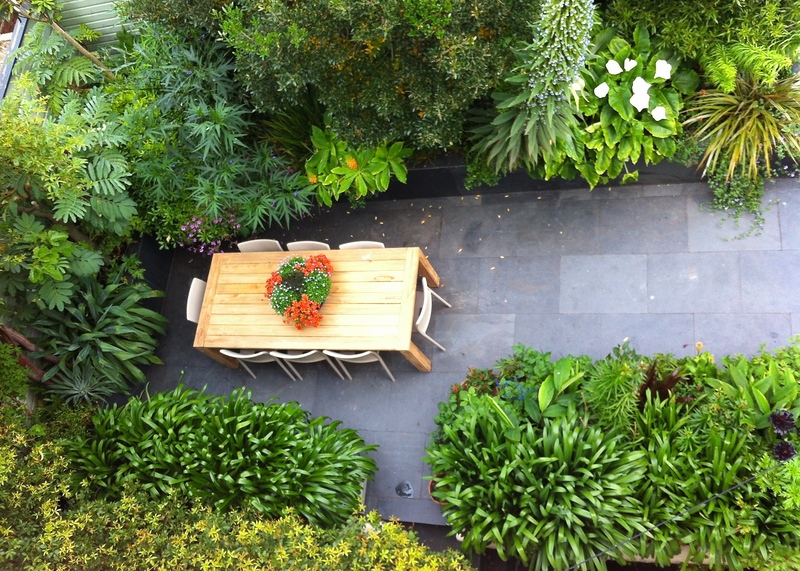 New garden furniture arrived this June, a reclaimed teak table surrounded by ‘Air’ chairs by Magis. The garden will be open on Saturday August 2nd and Sunday August 3rd from 12-4. Entrance £3. Well behaved adults, children and dogs are most welcome. 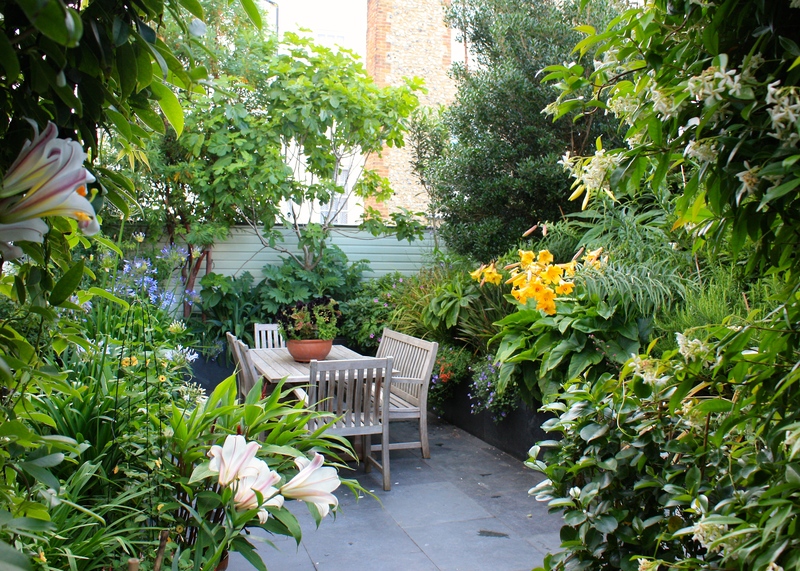 Please be mindful of the garden’s size (you can see more than two thirds of it in the image above) and that at times it may become quite cramped. This being our first time we don’t know quite how many people to expect. There will be refreshments in the garden, but in a town like Broadstairs there are lots of options from fine dining to fish and chips so perhaps combine your visit with a stroll along the seafront and a nice lunch. There is no car parking immediately outside the house. A carpark immediately off the High Street is your best bet, turn in between Cooke and Co. Estate Agents and The Fireplace Company. On Sunday there is unrestricted parking on some of the surrounding streets. From the station, The Watch House is about a 7 minute walk. 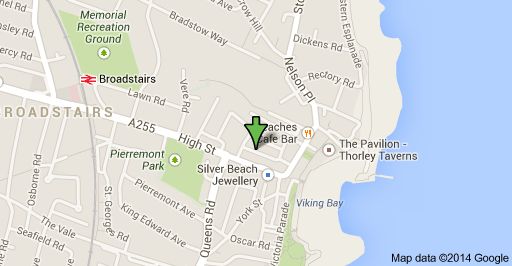 The address of the Watch House is 7, Thanet Road, Broadstairs, CT10 1LF. It is immediately next door to Elite Fitness Studio which is well signposted around the town. 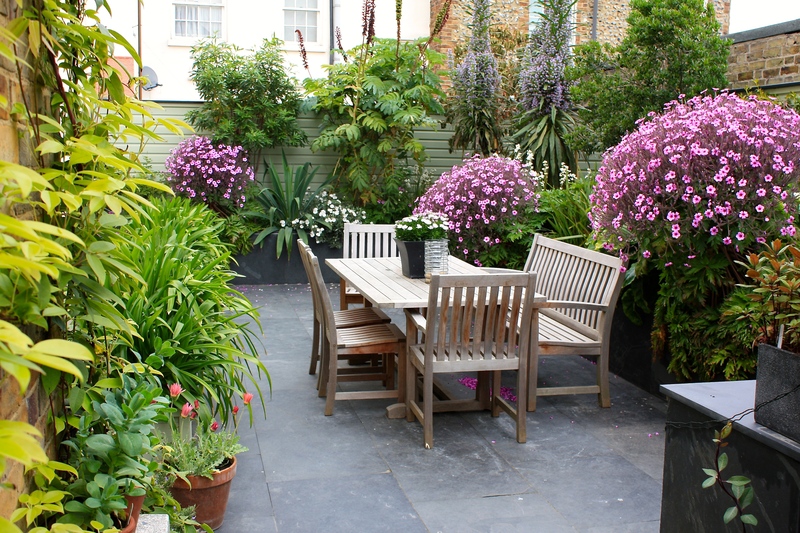 I thoroughly enjoyed the tour of your Broadstairs garden and feel a little envious, its a wonderful space. Well Jack, I believe South Africa has something like 10% of the world’s flora so you are in a fine place for a spot of botanising! It’s a shame we can’t just swap gardens – I’d like something on your scale, or at least I think I would. We look very small on Google Earth. Our neighbour got caught out for parking in our space though, as her car is shown as clear as day. Isn’t technology amazing. Hope all’s well with you? I’ll post some pictures of the open day. Love the outdoor kitchen, I want one now. Beautiful array of plants and flowers. 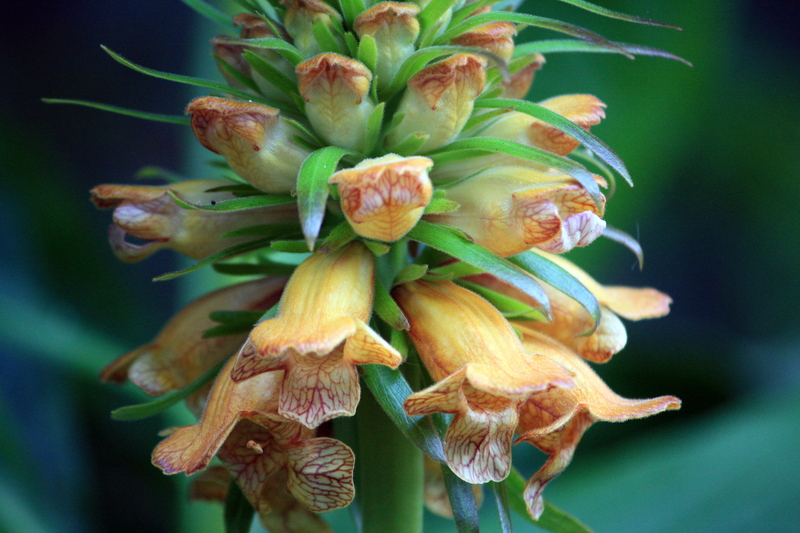 I like your digitalis too, don’t think I’ve ever seen one like it. Good luck with your open weekend. Thank you so much. 2 days to go!